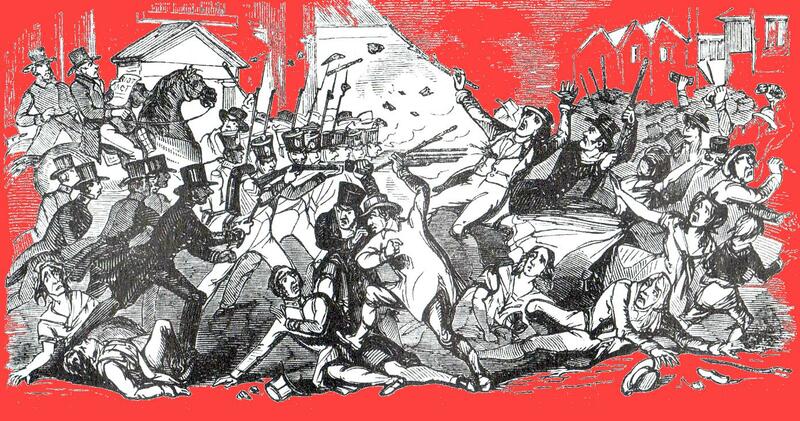 This chapter continues the story of Huddersfield radicalism told in ‘Liberty or Death’. It shows how radicalism revived following the bank crash of 1825/6, the collapse of the local fancy weaving trade and the extreme economic distress affecting thousands of local handloom weavers. Continuing concern about the machinery question, which had agitated domestic workers since the beginning of the century , culminating in Luddism, is also traced. [The brief history of the West Riding Fancy Union which preceded these events can be found in my ‘Handloom Fancy Weavers’, (1993) and in the chapter on ‘Labour Disputes and Trades Unions in the Industrial Revolution’ in ‘A Most Handsome Town’ edited by E A H Haigh (Huddersfield 1992)]. Due to the numerous bankruptcies and the collapse of the market, unemployment escalated rapidly. In March a committee was set up in Huddersfield to collect subscriptions for the relief of the distressed and by July it reported it had made disbursements totalling £2,787 to 10,709 persons. The Huddersfield Committee set up local committees to visit families in the affected townships to assess the level of distress. In Lepton at the beginning of May, 111 looms out of 166 worked by 74 families were totally idle and in August a survey, carried out by the Operatives Committee at the request of the Lord Lieutenant revealed that in Kirkburton 506 individuals were totally unemployed, 397 partially employed and 22 fully employed. In Kirkheaton the respective figures were 193, 149 and 18; in Almondbury 839, 616 and 59. Huddersfield market on the 15 August was described as one of the worst ever known, with prices ‘ruinous to the manufacturer’ which the following week remained ‘extremely low’; plaids selling at 6d a yard – the cost of weaving only a short time before – and swansdowns at 8d. a yard, compared to Is.6d the previous year. By now 2366 families – an estimated 12,000 people were receiving relief administered by 20 local committees. On the instruction of the London relief committee as many men as possible were found work on the roads at I/6d a day for married men, 1s for single men and 9d.for youths. After a’ glimmer of optimism around the beginning of October, the fancy trade at the market on the 10th was ‘much depressed.’ The following week it was ‘nearly extinct.’ A slight improvement in December with signs of revival in cassinett production was greeted with caution and although distress had increased in Honley by January, in Almondbury and some other townships ‘very sanguine hopes are entertained that a very material improvement will be experienced in a month or two.’ But, by the end of the month even cassinetts were unsalable – except a a loss. That same month William Norton, Joseph Ferrand of Almondbury, George Robinson of Deighton and John Armitage of Paddock were fined for paying their workers in goods. A meeting at Huddersfield of ‘fair manufacturers’ and workmen, resolved to halt the system by which the labourer was , ‘ground down to complete beggary’. Senior of Dalton described the practice as ‘contrary to law, to common sense, to humanity and to religion’. George Beaumont, an Almondbury fancy weaver, soon to emerge as one of the most notorious workers’ leaders in the area, made his first recorded political debut with ‘a very sensible speech’, in which he moved the vote of thanks of the meeting to the vicar and magistrates. Trade slackened in Autumn but it was still an improvement over the previous year. By February the fancy trade was again brisk and more buyers attended the market on the 19th than for some time, auguring well for 1828. Unfortunately as the epidemic of unemployment receded it was replaced by one of smallpox. A number of children died in the Honley area in October, the virulence of the disease, like a measles outbreak the previous year, perhaps assisted by the general debilitation of the population. An eyewitness account of this distress was sent by the Rev. C.B.Dunn to a patroness of the poor, Mrs Beaumont of Bretton Hall, describing his findings from a ‘minute and accurate survey’ of conditions in Cumberworth, Skelmanthorpe and Denby Dale. Of the families of fancy weavers , 661 individuals were living on 1½d each per day; 745 on 2½d and 340 on 3½d – as well as 1,000 in other occupations whose conditions were ‘equally deplorable’. His explanation of the problem vividly summarises the lot of the fancy weaver in these years. That such suspicions had some foundation is confirmed by a later recollection of the pro – reform cotton yarn dealer William Stocks, which is worth quoting extensively since he claimed a leading role in putting the Almondbury workers on the road of peaceful protest. This was the meeting which drew up the memorial to Harewood. However influential Stocks’ intercession was ,it still relied on workers themselves being able to advocate the line he proposed .The argument was not only popular enough to gain initial acceptance but it also survived the discouraging interview with Harewood. A more decisive factor was probably that the bulk of the distressed were fancy weavers who did not regard themselves in direct competition with factories or power looms. Even the palliative of relief offered as a solution by Harewood and the local authorities soon proved limited. Want increased as the harvest, which traditionally offered some seasonal employment for domestic workers finished at the end of August. Schemes were examined to provide work road repairing and the periodical £500 from the London Committee was accompanied by a directive to ‘communicate with Mr Mcadam with a view of finding employment on the roads for as large a proportion of the distressed manufacturers as possible. By early September the Mercury reported that distress, ‘has attained an unparalleled degree of severity and is still increasing.’ ” On 14 September gratuitous relief was ended by the Huddersfield committee following orders from the metropolitan committee. The unemployed were required to apply for tickets to do road mending from 8 to 12 in the morning and 1 to 5 in the afternoon – a task and regime which The Mercury noted, suited neither, ‘…the habits nor indeed the constitution of the weavers.’ According to William Stocks the outdoor work ‘made a great many of them ill’ and spoilt their hands for the delicate tasks required in weaving. Whilst cooperating with the middle classes over common problems the workers did not refrain from independent initiatives. At Almondbury on 26 February 1827 it was resolved to petition parliament for ‘a board of appeal for the purpose of deciding all disputes betwixt masters and workmen and for the establishment of a rate of wages suitable to the circumstance s of the time.’ At the end of May a large meeting of fancy weavers discussed more direct means of obtaining ‘a reasonable price for their labour’ and it was resolved that Norton’s 500 weavers should strike for an advance as they brought in their completed pieces. The strike was conducted by a ‘Weavers Committee”, which, considering the evident demise of the WRFU, may have been an ad hoc body. Other than this, no dispute of fancy weavers is recorded, unlike in neighbouring Saddleworth the following year,where hostility to truck led to the formation of a trade union and a virtual general strike of woollen ‘weavers and spinners. Historical conflicts between the working and middle class reformers resurfaced when the thanks of the meeting was voted to the reporters present, Foster of the Leeds Patriot and Thomas Baines of the Mercury. The latter eulogised his father Edward, editor of the Mercury as a veteran , ‘defender of popular rights’, and proud to be a Whig. Mann was stung to remind the meeting of his old adversary’s description of working class. radicals in 1817 as, ‘low, degraded and illiterate,’ and claimed that far from being a saviour of the insurrectionists he could have prevented Brandreth and the others going to the gallows if he had printed a supplement to the Mercury reporting the revelations about Oliver as he had been asked. The highpoint of this meeting was William Ashton a leader of the Barnsley linen weavers, who said he was present to ‘ascertain what were the opinions of the operative classes in the district,’ as the reports of the previous meeting had ‘caused some excitement’ in his own area. He was disappointed to find after he arrived that ‘there certainly appeared to be some laxity and tameness in some of the persons who had management of the meeting.’ and he couldn’t get a satisfactory answer about what they intended to do. He dismissed proposals to petition parliament as being useless without reform and waiting to see what manufacturers would do ‘was a waste of time’, as they had no power to help even they had the inclination. Calling on them to ‘hurl down the tyrants who oppressed them.’ and claiming the rest of the West Riding was looking to them for a lead, ‘He retired amidst the continued and deafening cheers of the assemblage.’ Despite the popularity of his speech, the meeting organisers claimed the tone of it was totally unexpected. Nor was it acted on, as it was decided to wait three weeks for a reply from the masters who had been approached. In the meantime though, they set up a committee with Beaumont as secretary to communicate with other towns and villages. Again at this meeting, machinery was condemned. Edward Dixon, as well as introducing the new topic of maintenance of the church when it was outnumbered by dissenters, explained that paper currency had helped ,’augment the power of the steam engine.’ and led to overtrading and competition. A resolution was moved describing machinery as, ‘injurious to the labouring community of this country’, – according to Beaumont ,in trades like cloth-dressing it had deprived seven out of eight of employment. It ‘used no tea or sugar or wore waistcoats,’ and he suggested the tax burdens of those impoverished by it should be relieved by a duty on power manufactured goods. He also described the effect it had on the degeneration of domestic life in terms which were to become familiar over the next few years. The basic argument of the advocates of machinery was dismissed by Dixon. 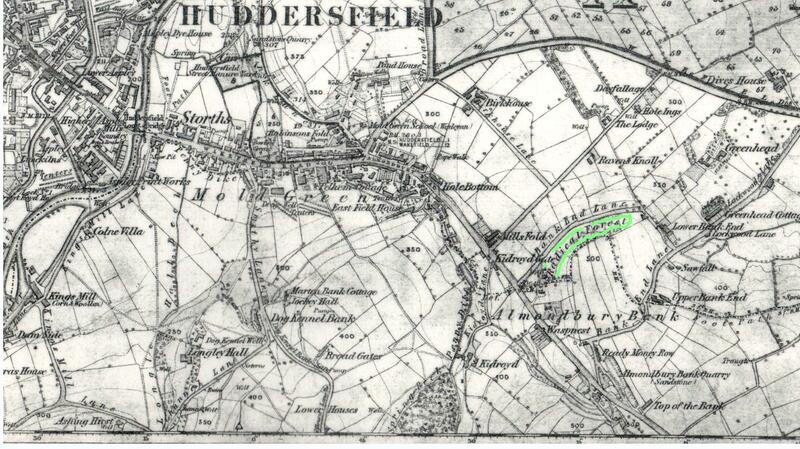 Almondbury Bank on map of early 1850s showing location of ‘Radical Forest’. Stocks advocated the fixing of minimum and maximum wages but Wood of Dalton objected that this would drive manufactures abroad – currency and tax changes and the reduction of government salaries and debt were necessary. A resolution unanimously acceptable was passed attributing low wages and profits to high taxes and rents increased by the currency change. The only practical measure decided was the formation of committees to act with the parish officers in continuing relief. The trough of the depression was reached in the winter of 1829/30. The recovery which followed was slow, uneven and, for many weavers, barely perceptible. In March 1830 manufacturers complained that it was low prices which prevented them advancing wages although some improvement in the fancy districts was reported.. Shopkeepers and publicans were still, ‘rapidly verging into the vortex of ruin.’ And at a meeting in May the Radical fancy weaver Sam Dickinson claimed that,’ hopes of amelioration…are altogether fallacious and delusive.’ The capriciousness of the factors governing the fancy trade was underlined by a comment in the Mercury of the same week., ‘the precarious state of his majesty’s health has had a very injurious effect on the fancy trade.’ while in October it was claimed that about 3,000 weavers were unemployed because of the entry of a superior product from Bradford onto the market..
Dickinson recalled the various meetings in the area which had drawn up petitions only for them to be ignored by parliament. It was necessary that all classes in society ,both high and low, rich and poor should come forward and join in one strong bond of union.’ Amidst some cries of dissent from the crowd Spivey read the rules of the Birmingham Political Union (BPU) calling for suffrage on a household or rate paying basis as a step in the right direction and likely to attract middle class support. John Wood the Dalton manufacturer advised them to establish a Political Union , ‘for effectual reform in parliament, without giving it any particular name. 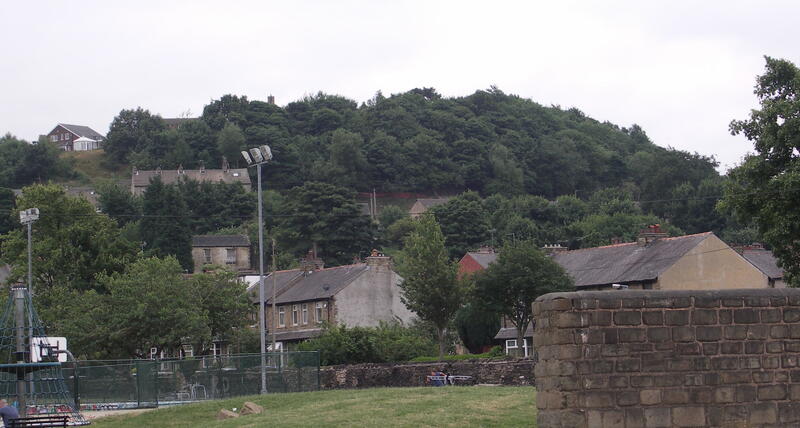 ‘Radical Forest’, Almondbury Bank, site of Radical meetings in the 1820s and 30s – (although the topography has since changed). This was the line advocated by the Mercury who had criticised the Leeds radicals adherence to the Metropolitan Political Union (MPU) with its demands for universal suffrage, annual parliaments and vote by ballot, appealing to working class radicals to avoid ‘prescribing particular plans.’ James Mann meanwhile had forwarded twelve copies of the MPU rules to the Almondbury radicals who had also received a letter and a copy of a MPU resolution from Matthew Riley. To the relief of the Mercury, when the MPU rules were read out to the meeting by Dickinson, no decision was made to adopt either that or the BPU model and a broad resolution was passed to seek an unspecified extension of the francise, vote by ballot, elections on the same day and triennial parliaments. The Mercury commended the Almondbury operatives for their, ‘spirit of union and moderation,’ and their awareness of the need to unite all the pro-reform forces since they ‘abstained from insinuating their own particular views.’ It noted some ‘violent expressions’ were used, ‘which however, find much excuse in the severe suffering the speakers have witnessed and experienced.’ Beaumont’s remarks on machinery were tactfully described as ‘mistaken’. A reply appeared the following week signed by five members of the Operatives Committee, claiming that Beaumont had not been authorised to write the letter and that they disagreed with some of its sentiments. Beaumont’s conduct had been such of late, ‘that they could not with propriety act with him.’ While making clear that they were not opposed to a union of the different classes it is not apparent whether it was the invitation offered to the ‘gentlemen’ to attend the meeting or the ultimatum which they found objectionable. The explanation offered at the 10 May meeting ,which passed a vote of confidence in Beaumont for his faithful and honourable conduct as a committee man, does not reveal any political conflicts that may have split the Operatives Committee and adds a further note of intrigue by simply claiming that the signatories to the letter were unaware that a new committee had been formed ! At that meeting Mann of Leeds and Samuel Midgeley proposed the adoption of the MPU rules and aims which were overwhelmingly endorsed by the meeting. A ten man council was nominated with Joseph North, a schoolmaster of Lower Houses as secretary, including Dickinson, Beaumont, who at this meeting had again called for , ‘a general political union between the middling and labouring classes of Almondbury and its vicinity’, and Midgeley. That none of the signatories of the Operatives Committee letter against Beaumont were included in the Political council may be significant , but neither was J Spivey. It is not clear if the O.C. continued in existence . Thomas Cliffe , a Halifax Radical, condemned the aristocracy, took a swipe at the Malthusians, (‘those blaspheming petitioners’ ,who attributed distress to, ‘God’s fault overproduction and a redundant population.’) and then advised the meeting to seek support from William IV, as he was known to hold liberal principles. The meeting closed with thanks to O’Connell, John Wood ;MP for Preston, Henry Hunt , the. council and members of the MPU, followed by three cheers for the king. The leading local radical, the shoemaker Abraham Hanson, (who had spoken on Almondbury Bank in April), called on the meeting to ‘rally round the throne as the only place from whence they might expect redress for their grievances.’ If they did the King would ‘instantly set about reform.’ Beaumont took up a different theme ,referring to the overthrow of Charles X by the July insurrection in Paris, ‘…it would be a consolation to every friend of freedom to know that the heroic people of France had bravely struggled and had been successful in emancipating themselves from the iron hand of tyranny and oppression. (Cheers)’. The ambiguous response of Radicals to the republican revolution in France was epitomised later that month when they marched under tricolours to Almondbury Bank and voted to petition William·IV to support radical reform. Attention was also directed to unrest nearer home by Beaumont, who issued an appeal to the agricultural labourers to stop destroying machinery and produce and join the labouring classes of the manufacturing districts in securing reform. As well as their role in promoting the Elland Political Union the Almondbury Radicals also proselytised nearer home. On the 18 October a large meeting was held at Honley infants school at which Beaumont and Dickinson introduced a debate on the relative merits of the BPU and the MPU • As a result a Political Union was established on the line of. the latter with a woolsorter, Thomas Ledger, as secretary. On the 27 October Beaumont was speaking at a meeting at Keighley on France and reform and on 1 November came the culmination of local Radicals’ efforts – the foundation of Huddersfield Political Union. BHC.23.Feb.I826 , BHC 16, 23 Mar, 14 Dec.1826;LM. 11,18 Mar,24 Jun, 9 Sep. 1826. LM Apr. 1826 , LM Mar.I826. Parliamentary Papers VI.1833 ‘Report from the Select Committee on Manufactures, Commerce and Shipping with Minutes of Evidence’. William Stocks’ evidence pp 597-600: 637-647. LM 7, 14,21 Oct, 9 Dec 1826. LM 31 Mar;26 May 1827;BHC 4 May 1827;LM 23 Jun;21 Jul 1827. LM 3 Nov 1827;27 Oct,1 Nov 1828;LM 10 Mar,4 Apr 1827. LM 31 Jan,11 Apr,27 Jun 1829. .LM 3 Aug,19 Sep,12 Dec 1829;PP 1833 VI Wm Stocks evidence. .LM 3 Oct,14 Nov 1829. LM 16 Oct 1829;Wm Stocks op.cit. LM 12 Dec.1829. Bretton Hall College Archives BEA/c2.133/51a. Dunn to Mrs Beaumont 14 Jan 1830 and 51b. Dunn to Brakenridge, agent to Bretton estate, 21 Jan 1830 (I am indebted to Cyril Pearce, former curator of the Bretton Estate archives, for these valuable references). LM 13 May 1826, LM.20 May 1926; LM 27 May 1826.
; LM 8 Jul 1826. William Stocks evidence, op. cit. This may be the same man who appears on Republican subscription lists. LM Jun.I829; LM.20 Jun 1829. Leeds Patriot 20 Jun 1829. The Mercury did not report Ashton’s speech in detail, describing it as ·an “intemperate and inflammatory harangue”. At the next meeting (LM 11 Jul) Frank Mirfield,Ashton’s comrade was not allowed to speak until the chair was vacated. By the end of October they were both on the run as a result of disturbances arising from the Barnsley linen weavers strike. (LM 10 Oct.I829) ; Dixon, LM 11 Jun 1829. LM 12 Dec 1829. Although at this meeting the Rev.Drawbridge refers to Beaumont as a ‘young man’ , he was 35. LM 16 Jan 1830. Spivey was an activist of the WRFU and may be the man of that name who spoke at the Almondbury Bank meeting in 1819 – and possible supporter of Carlile. LM 13, 20 Mar 1830; LM 27 Mar 1830; LM 15 May 1830; LM 2 Oct 1830. LM May I830. LM 15 May.I830. LM 5 Jun I830. LM 5 Jun 1830; LM.21 Aug.I830. LM 11 Sep 1830; LM 18 Sep 1830. Letter from George Beaumont. LM.30 Oct 1830. Almondbury meeting, Keighley meeting; LM.23 Oct 1830, Honley meeting.